Ford Transit MK2 wheels and rims category has in offer hubcaps and wheel nuts. Ford Transit MK2 wheels and rims category has in offer hubcaps and wheel nuts. Our internet offer also includes components such as the wheels, the rims, the nuts or the wheel rim, which match to Ford Transit MK2 model produced from 1978 to 1985. Such aged vans are more subjected to mechanical damages. Moreover, tens of one thousand kilometers are traversed mostly irrelevant in the quality of the surface, and especially in the periphery can be very tricky. Sometimes a moment of inattention is the reason of entering into a deep hole, which can affect, for example, to bend the rim. That’s why, the frequent changing of the wheels or the rims is nothing special. Apart from basic spare parts in our offer we also own minor additives responsible for the aesthetics and safety. For this type of elements belong a.o. 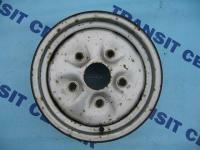 the hubcap or the wheel trim ring for example for Ford Transit from 1984. If the car often rides in the city, we honestly recommended the steel wheels, which are more durable. Because this is a collector’s model, in some measure, our offer is also directed to this group of holders the vehicles. We encourage to buy in our internet shop – Transit Center and contact by e-mail address: info@transitcenter.co.uk.